Do you need an RV Dehumidifier? 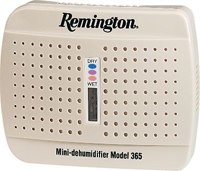 Do you need a dehumidifier for your RV or Camper? Opinions on this differ. RVs and Campers are not all the same, nor are the conditions in which they're used or stored. Some folks manage quite well without a Camper or RV dehumidifier, others swear by them. The one thing that's common to all is that if they don't have an RV mold or condensation problem it's because they take steps to prevent it. Think about life in a Recreational Vehicle or Camper. It's an enclosed space. It cools down at night much faster than a house. We breathe, we shower, we cook and some of us use propane for heating too. All of these activities create water vapor which will condense when the RV cools. The trouble with condensation is more than just our personal discomfort. Mold and mildew thrive and our RV, not to mention our clothes and possessions, are damaged. First, we can produce less water vapor. We can't stop breathing but we can use the bathroom vent when we shower and the range hood vent when we cook. Lots of us go further and shower in the campground facilities and cook outside when we can. Propane heaters produce a lot of water too. Using electric heaters produces no water but is not always an option, particularly if we're boondocking. Our second line of defence is ventilation. Opening doors and windows will help to flush out the excess moisture and leaving a vent or window open, even a little, will slow down the build up of water vapor over night. These are great strategies, if you're a warm weather, vacation camper; but what if you vacation somewhere cool, or live year round in your RV, some place where the winters get a mite frosty? Opening doors and windows may not be such a neat solution for you. In that case you may find a Camper or RV Dehumidifier a useful, if not essential supplement to the other precautions you're able to take. So, if we've answered the question, "why use a dehumidifier? ", what is the best type to use? You could use one or more rechargeable units which contain a desiccant material. They work by using the water absorbing properties of silica gel and don't need a permanent power supply, although they do need to be recharged at the main electricity supply every six to eight weeks. The rechargeable type is most commonly used in enclosed spaces, such as a closet or small bathroom and may be useful if you have a localised mold or condensation problem in your RV. You will almost certainly need more than one if you opt for this solution for your entire vehicle. A refrigerant model is probably more suitable if you want a single appliance to keep your whole camper or RV mold and moisture free. Any refrigerant unit with a sufficient capacity will do the job but those specifically designed for RVs and Campers are more compact and with a height low in proportion to their width and length so as to have a low centre of gravity. This makes them more stable when the vehicle is in motion. A purpose designed RV dehumidifier should also have a non slip base and any appliance should, of course, be secured when you are driving the vehicle. 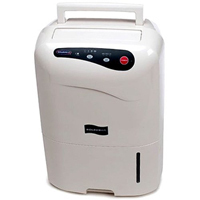 A purpose designed RV Dehumidifier will certainly cost more than a portable model and if you prefer to spend less there is a portable which we recommend. The Soleus CFM25E is of slimmer design than most other portable models, ideal for use in a vehicle. It is reliable, quiet and has a moisture removal capacity of 25 pints per day which will be enough for any RV or Camper. If you would like to know more about this model please visit our Soleus CFM25E review page for full details. Refrigerant models need a mains electricity supply or equivalent so are not suitable if you are neither hooked-up at a campground nor have your own generator. 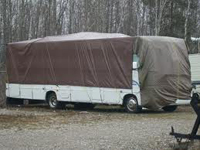 For those of us who don't live in our RV full time, a major problem is keeping our vehicles free from condensation and mold while they're off the road, usually for the winter. Obviously we're not producing all that extra moisture, showering cooking etc., while the vehicle is not in use but, if the winters are cold, condensation will still be a problem. The usual precautions should be taken against rain water entering the vehicle and some ventilation is desirable. If you still have a problem, however, a dehumidifier would be advisable. RV's are usually stored within reach of mains electricity so a refrigerant model is still an option and would be our recommendation. A number of strategically placed rechargeable units would be an acceptable second choice. If you already have an RV Dehumidifier you would, obviously, use it. If you find you only need one when your RV is in storage, any domestic model with a suitable capacity would work equally well, and will certainly be less expensive than the purpose designed models. You should ensure that, whatever refrigerant model you use, it has two features. First a humidistat, like a thermostat for the heating system, to set the relative humidity at which you want the appliance to switch itself on and off. This avoids wasting expensive energy. Second, a drainage system whereby you can attach a hose and drain off water from the bucket when it fills. 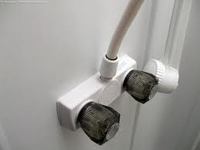 If you feed the hose into a sink or other suitable place the dehumidifier will drain into the sink and not switch itself off when the bucket is full.